(15700, Ruth Mohler Collection, OHS). (State Historic Preservation Office, OHS). (photo by Fred Weimer, State Historic Preservation Office, OHS). (10236, W. A. Rigg Collection, OHS). 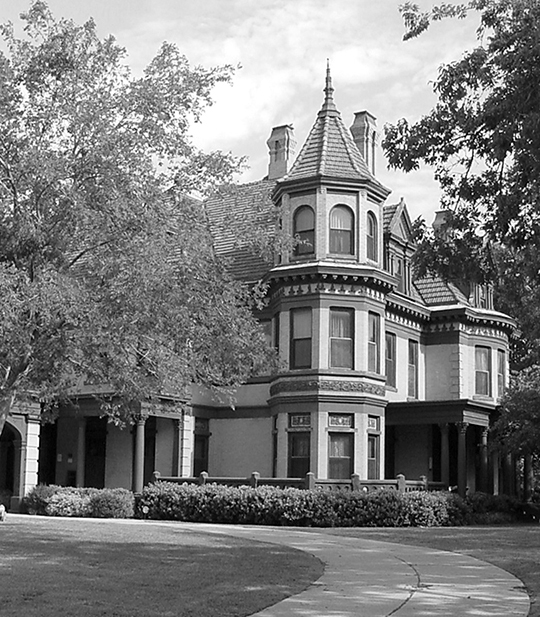 Oklahoma's architectural landscape has a long and varied history. From indigenous Native groups who constructed their own styles of housing, to modern glass-and-steel buildings of the twenty-first century, most architectural styles and trends have been found in the geographical area that is the state of Oklahoma. In the 1700s the French explorer La Harpe flew his flag over the beehive grass houses of Wichita Indian villages on the Canadian and Arkansas Rivers in eastern Oklahoma. He had no knowledge of the decline two hundred years earlier of a culture whose people had lived in permanent communities for a millennium. These Mississippian mound builders constructed earth mounds more than forty feet tall to serve as platforms for houses, ceremonies, and burials. Discovery of Spiro Mounds in the Poteau River Valley did not occur until the 1920s when a small group of uninformed citizens, organized as the Pocola Mine Company, used shovels and black powder in a haphazard search for treasure. In the years following the Louisiana Purchase, conflicts between Indians and white settlers in the southeastern states resulted in passage of the Indian Removal Act of 1830 for relocation of five major tribes—Cherokee, Chickasaw, Choctaw, Creek, and Seminole—to Indian Territory. Fort Gibson, built in 1824 near the mouth of the Grand River was erected to protect the new immigrants. Made of logs, it was the first major building in the territory. Much of the early domestic architecture of the new settlers, both Indian and Anglo, was also of log construction and reflected a pattern of vernacular buildings prominent in Appalachia. Many of the single-room houses were simple gable-end cabins typically having a covered porch extending across the front on the eave side. Chimneys were usually located on one of the exterior gable walls, and when expansion became necessary, another room was attached at either of the gable ends. If the addition was attached to the chimney gable, the house was known as a "saddlebag"; if another room and second chimney was attached to the opposite gable, it was called a "Cumberland." Another variation was the "dogtrot," in which a separate, detached room was added with an open porch between, and with all the components covered by a common roof. One of the earliest dogtrots in Oklahoma, the 1837 Choctaw Chief's House, had a continuous second floor that provided a habitable space over the open porch. By contrast, some of the antebellum houses of affluent Cherokee leaders at Park Hill illustrated popular architectural styles, with finished siding, oak doors, and windows and furnishings brought upriver by boat from New Orleans. In the years following the Civil War the Indian Territory became a mosaic of tribal cultures. The 1867 Treaty of Medicine Lodge Creek New established new reservations for Plains Indian peoples. Tribes of the original removal process were forced to surrender promised lands for another wave of Indian immigrants. During the period of Reconstruction the Creek, Chickasaw, Choctaw, and Cherokee Nations all built new council houses in eclectic architectural styles fashionable throughout America. 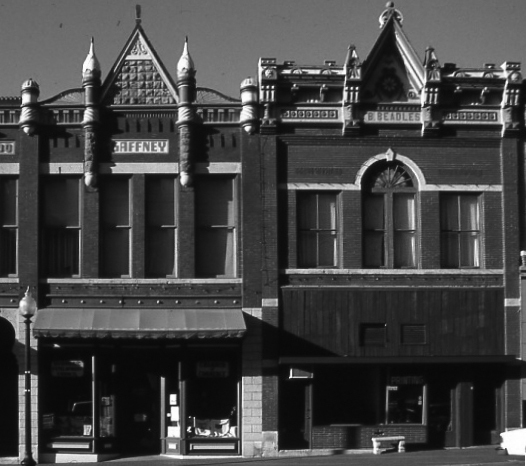 All of these are notable buildings, and the Creek Council House in Okmulgee, now listed as a National Historic Landmark, is exceptional. In the western area of the territory the most significant buildings of the reservation period were those at Fort Sill and Fort Reno, constructed because of escalating conflicts with relocated Plains Indians. The opening of the Unassigned Lands of central Oklahoma in 1889 brought unparalleled opportunities for growth and expansion. Pressed by land-hungry homesteaders and profit-hungry railroads, Congress developed a policy of phased openings of Indian lands by run, lottery, and auction. 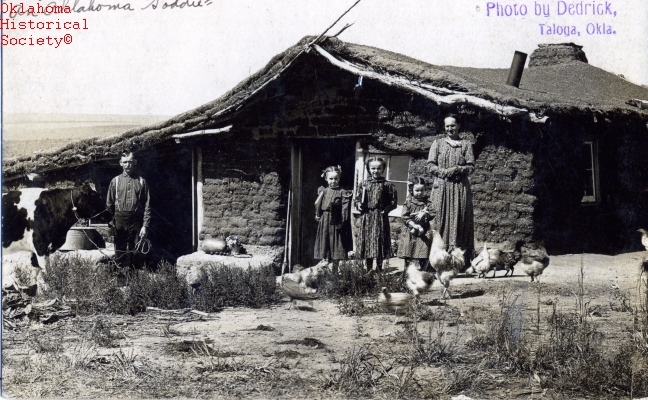 The impact of the Organic Act created a prairie landscape of sod-house farmsteads. New towns arose, and Oklahoma Territory was established as a political and spatial entity. But it had a devastating impact on tribal cultures: with the disappearance of their lands they became an isolated minority scattered throughout the rural landscape. The most important town, both politically and architecturally, of the new territory was Guthrie. Anticipating its designation as the new territorial capital, thousands sought lots in the hilly town sites in a mad and chaotic scramble during the first of the land runs. On the morning of April 22, 1889, there were only four small buildings in Guthrie, but by dark it was filled with tents. The transformation of the "instant city" immediately began. By nightfall a newspaper was published. The next day wooden buildings were being erected and within months fireproof masonry buildings were under construction. Responsible for creating many of these new buildings of native stone and brick was Flemish immigrant architect Joseph Pierre Foucart. With his visions of eclectic Victorian architecture, he was the premiere contributor to Guthrie's urban fabric. As the Twin Territories advanced politically toward statehood, Guthrie and Oklahoma City vied for state capital designation. Guthrie lost and languished as Oklahoma City, with its intersecting railroads and far-sighted developers, rapidly grew. Solomon A. Layton supplanted Foucart as the dominant architect of the early twentieth century. In a career spanning several decades, and marked by his stunning design of the 1911 Skirvin Hotel and the 1917 Oklahoma Capitol, Layton became the state's most prolific and popular architect. It was an era when the Victorian style declined and was replaced by another resurgence of Neoclassicism. In domestic architecture the Spanish Colonial and Mission Revival styles gained popularity in Oklahoma, although Craftsman-style bungalows became the dominant architectural expression of the middle class. The enormous houses of the oil barons in the Sooner State, lavish with ornamentation, symbolized their achievements and new-found wealth. 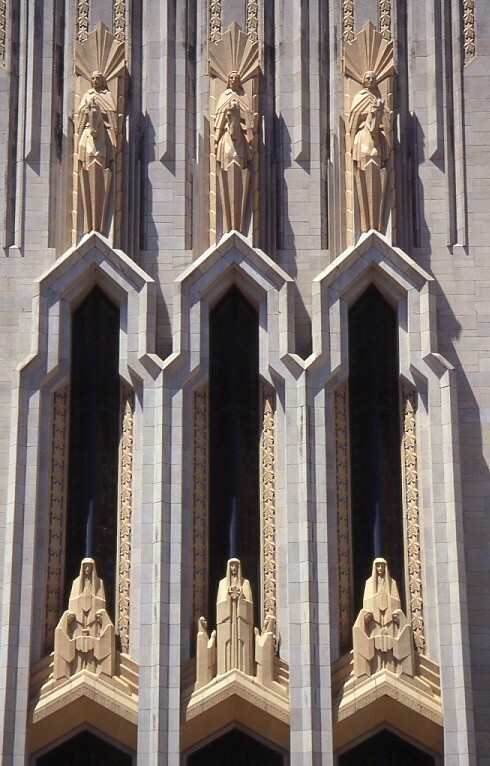 The city of Tulsa, in displays of civic pride during the oil boom, saw creation of expressive architecture with construction of the downtown Philtower and Philcade Buildings, the Christ the King Church by the Chicago architect Barry Byrne, the nearby Boston Avenue Methodist Episcopal Church designed by the youthful Bruce Goff, and an ensemble of exceptional Art Deco buildings. The effect of the Great Depression of the 1930s saw both the fluorescence of the Art Deco style and the emergence of new variations through buildings constructed under the aegis of federal programs. In Oklahoma many new courthouses and civic buildings, schools, National Guard armories, and structures at state parks were realized through the Public Works Administration (PWA), the Works Progress Administration (WPA), and the Civilian Conservation Corps (CCC). The post–World War II years in Oklahoma witnessed the rise of Bruce Goff to prominence with design of the Ledbetter and Bavinger Houses in Norman. 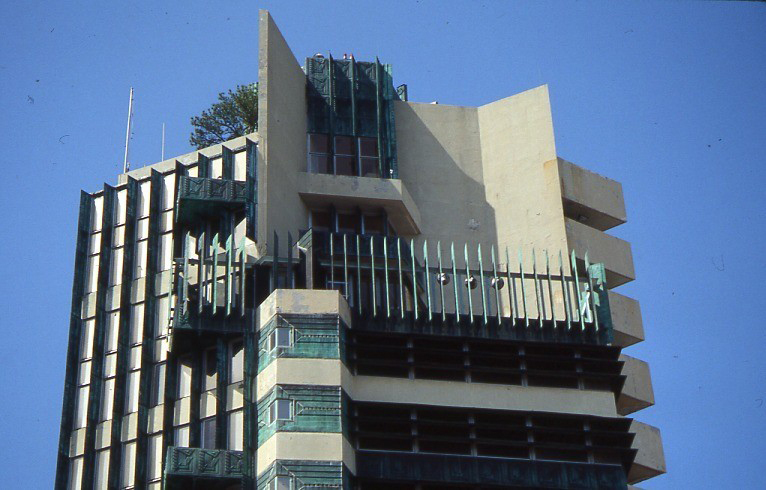 Nationally prominent architect Frank Lloyd Wright created the remarkable Price Tower in Bartlesville as the "tree which escaped the crowded forest." In recent years the major cities have seen development of diversified and expressive movements in architecture and urban design. An important aspect of change in the environment has been development of the historic preservation movement. Oklahoma is a place of both urban and rural duality with a rich assemblage of high style and vernacular architecture. Preservation, through a process of rehabilitation and adaptive reuse, clearly defines the continuing presence of buildings as metaphors of culture. Oklahoma's architecture reflects the essence of a place's origins, its growth and its purpose. Bob L. Blackburn, Arn Henderson, and Melvena Thurman, The Physical Legacy: Buildings of Oklahoma County, 1889–1931 (Oklahoma City: Oklahoma County Historical Society, 1980). David Gebhard and David Halpern, Tulsa Art Deco: An Architectural Era, 1925–1942 (2d ed. ; Tulsa, Okla.: Tulsa Foundation for Architecture, 2001). Great Buildings Ahead: A Guided Tour of Central Oklahoma's Architectural Landmarks (Oklahoma City: American Institute of Architects, Central Oklahoma Chapter, 1989). Arn Henderson, Frank Parman, and Dortha Henderson, Architecture in Oklahoma: Landmark and Vernacular (Norman, Okla.: Point Riders Press, 1978). Howard L. Meredith and Mary Ellen Meredith, eds., Of the Earth: Oklahoma Architectural History (Oklahoma City: Oklahoma Historical Society, 1980). 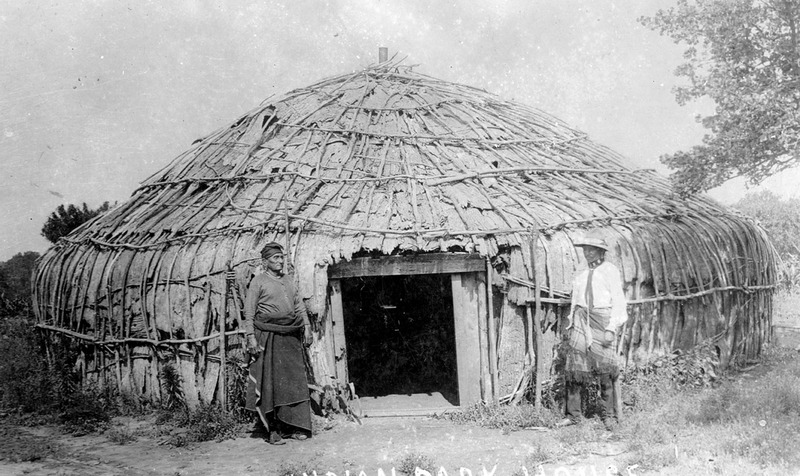 Peter Nabokov and Robert Easton, Native American Architecture (New York: Oxford University Press, 1989). Mary Jo Nelson, The Buildings of Solomon Andrew Layton (Oklahoma City: Oklahoma Historical Society, 1977). Arn Henderson, "Architecture," The Encyclopedia of Oklahoma History and Culture, https://www.okhistory.org/publications/enc/entry.php?entry=AR022.